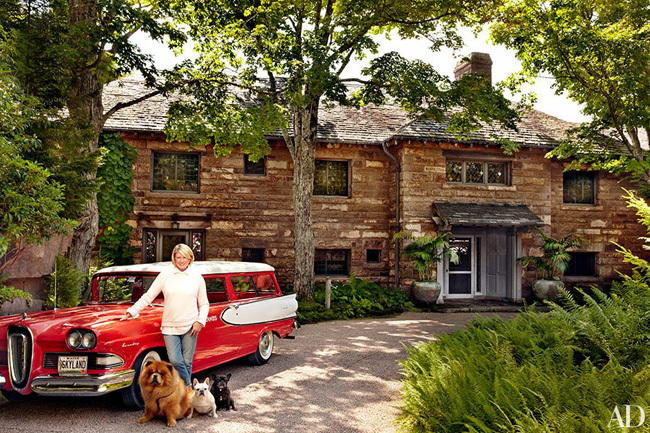 Be sure to pick up the July, 2015, issue of Architectural Digest, which features a visit to Skylands, Martha Stewart's home in Maine. Photographer Pieter Estersohn and writer Jeffrey Bilhuber visited the historic estate last August while Martha was vacationing there. This is the first time one of Martha's homes has been featured in Architectural Digest. There are numerous photographs of the home inside the magazine, including some rarely seen rooms, such as the flower room. Click here to read a segment of the article and view a slideshow. “I look at myself as the caretaker of an American treasure,” says Martha, who spends part of July and August here as well as long weekends throughout the year. The house is a catalyst for her imagination and a sparker of ideas for her design empire. Ms Stewart's design sence has for too long been ignored by major home design magazines. At last when we see AD recognize her taste they started out, in my opinion, with the most beautiful home! They should definitely do a series on Martha's different homes in AD. Too bad Turkey Hill is no longer here to be chronicled. Martha has such a specific aesthetic--which I find just beautiful. She uses such gorgeous vintage and antique items (not always ultra expensive, either) in an understated way and the way she pulls her collections together are always an inspiration to me. Let's see--I collect jadeite, aqua McCoy, banded yelloware bowls, footed pressed glass compotes, mercury glass, and I'm dying to find a federal gilt pier mirror---following Martha has refined my personal taste level so much over the years. I love the picture of the master bedroom. I see one of the Federal overmantle mirrors and the Asian embroidery pictures from grandmother Gilbert that used to hang in Turkey Hill's dining room are still around! I would so love to tour Martha's farm and Skylands. Would be so wonderful. Thanks for sharing!